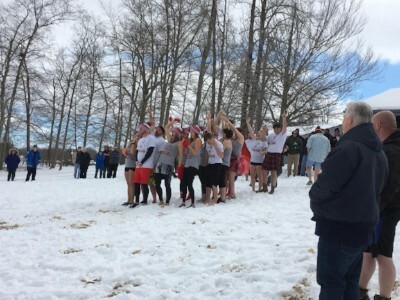 The 13th Annual Roaming Shores Polar Bear Plunge was held over the weekend. There may not have been any ice of the lake, but it was still a chilly day with even chillier waters. That didn’t stop 75 brave jumpers from taking the icy plunge! 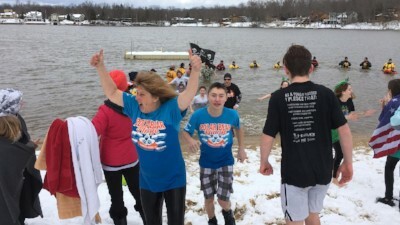 This year’s Plunge raised $7,635 which will be used to benefit the Jeff Meddock Memorial Scholarship, Jefferson Area Local Schools Academic Boosters, Grand Valley Schools student programs in memory of Emily Plickert, and the Roaming Shores Breakfast with Santa event. Thanks to everyone who turned out for this year’s Plunge whether you were one of the brave souls who took the plunge or were there to cheer on those who did! 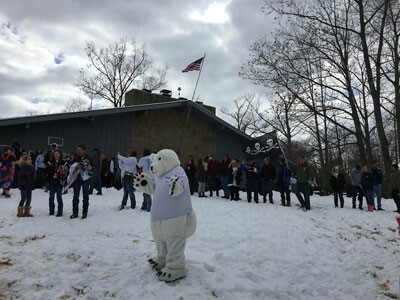 Gayle Zirkle, Polar Bear Club President, triumphantly emerges from the icy plunge! Team Wild Side raised over $2000! Thank you to the members and volunteers of the Polar Bear Club for organizing such a great event! A big thanks to all of the Plunge’s business sponsors and to all of the local rescue teams! Thanks also go out to the Cannon family for their donation of the Aqua Lily Pad that was raffled off.